Let's look at this chipmaker's dividend. Chipmaker Marvell Technology Group (NASDAQ:MRVL) was founded in 1995, and in 2012, the company announced its very first quarterly dividend. That dividend was good for $0.06 per share, or $0.24 on an annual basis. On the day that the dividend was first announced -- May 16, 2012 -- that dividend translated into a dividend yield of around 1.77%, based on the stock's closing price on that date. That wasn't huge by any stretch of the imagination, but it was a reasonable dividend nonetheless. What's interesting is that six years later, the company hasn't increased its dividend payments at all. The company most recently declared a $0.06-per-share dividend on Dec. 10, 2018, payable on Jan. 15, 2019. Here, I'd like to take a broader look at Marvell's capital return program and what that could mean for the dividend over the long term. I don't think Marvell's dividend hasn't gone anywhere because the company is necessarily being stingy about giving back cash to its shareholders. Back at its 2018 investor day, the company said that -- over the long term -- it hopes to give "[at] least 50% of free cash flow to shareholders" through a combination of both dividend payments and share repurchases. You'll note in the slide that Marvell put its share repurchase program on hold between the fourth quarter of fiscal 2018 and the second quarter of its fiscal 2019 because of its fairly substantial acquisition of networking chip specialist Cavium for a combination of cash and stock. So, if Marvell suspended the buyback -- the method that it seems to favor for shareholder returns -- a dividend increase probably wasn't in the cards, either. MRVL Free Cash Flow (TTM) data by YCharts. 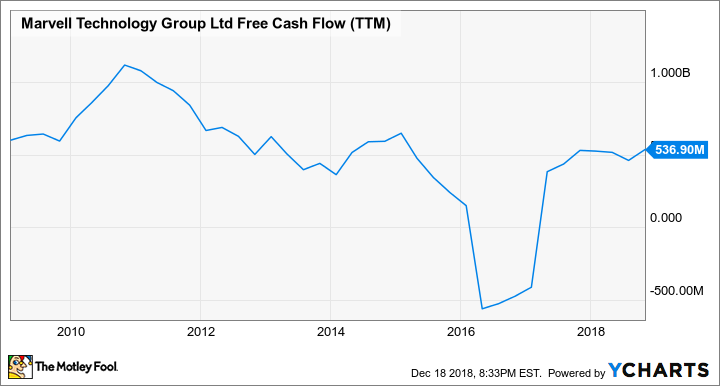 So, given that the company's free cash flow trend has been fairly choppy since it first initiated the dividend, it's not surprising that it'd be reluctant to increase the dividend, ultimately putting itself further on the hook financially. Ultimately, Marvell's current intentions with respect to its dividend look good, but circumstances just haven't been conducive to a significant dividend raise. The company's current dividend of $0.24 per share on an annual basis works out to just over $157 million in annual dividend payments, or approximately 30% of its trailing 12-month free cash flow. The company, quite bluntly, is playing it safe with the dividend. I think that over the long term, Marvell will want to start increasing its dividend to try to make the stock more attractive. However, between debt repayments and its clear preference for share repurchases, it could be a while before the company does deliver on a dividend raise. What this means is that if one of your criteria for investing in a stock is a history of dividend growth and prospects for continued dividend growth, then stay away from Marvell's stock -- this simply isn't a stock for dividend growth investors. There are other great chip companies (as well as, more broadly, technology companies) that not only offer fatter yields than what Marvell offers, but also have proven track records of dividend increases.